Gyokuro Green Tea Guide - A Real Challenge? Gyokuro is the most fascinating Japanese green tea, but for an average Western drinker, it is hard to get the real thing. Literally translated as "Jade Dew" for its pale green infusion, this tea is famous for being the most expensive of Japanese teas. One can't help but ask: What makes it different from sencha? Two things: the type of tea plant used and how it is grown. While sencha is most commonly harvested from the Yabukita tea bush, gyokuro is more commonly harvested from the Asahi tea bush, as well as the Okumidori, Yamakai and Sae Midori. While sencha grows in full sun, gyokuro grows in shade. About 20 days before harvesting begins, they are shrouded in black cloth that lets in only a small amount of sunlight. The finest gyokuro is grown using the tana method. Trellises are built around the tea bushes and draped with black fabric. Straw mats may be placed on top to block out even more sunlight. In the jikagise method, black netting is simply draped over the plants. Gyokuro tea plants are only harvested once a year in spring (just like other high grade green teas in China.) This is because the shading drains the tea bushes of energy and they need time to recover. Gyokuro is shaded for about 20 days prior to harvesting. Growing tea under wraps changes the chemistry of the tea leaves. Limiting the sunlight prevents theanine from converting to catechins, resulting in lower astringency, more sweetness and a richer flavor. 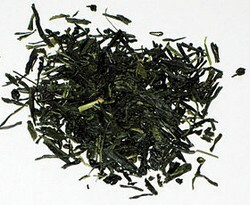 An oika aroma, similar to nori seaweed, is a unique characteristic of gyokuro. The shade-growing method has been used since 16th century, but this type of tea was not officially discovered and named until 1835. The Yamamotoyama tea company was the first company to grow and produce it. The main producing regions are Uji, Okabe and Yame. The best gyokuro is grown in gardens located near the city of Yame in the Fukuoka region. However, top-quality gyokuro is also grown in the tea gardens of the Uji region, some of the oldest tea gardens in Japan, as well as in the Shizuoka prefecture. Gyokuro is not a tea for everyday consumption. High prices aside, it is not a forgiving tea. To enjoy its sweet, vegetal flavor, you need to brew it precisely. If the water is too hot or the tea is left to steep too long, it becomes astringent and bitter. You have been warned! You won't believe it, but this tea has to be brewed at REALLY low temperature. The idea is that you use LOTS of leaves, but steep for a longer period of time to extract the flavors slowly. Brew the tea at about 120 Fahrenheit or 50 degree Celsius. Observe a fair wisp of steam. Brew the tea at about 140 Fahrenheit or 60 degree Celsius. Observe a small rising wisp of steam. This is not exact science, your best bet is to read the package instructions. Please note the amount of water you use is much less than your cup size. This is because the gyokuro leaves expand during brewing, taking up much space. You may want to be conservative i.e. use less leaves if you are not sure! Try 1 gram of leaves for 2/3 ounce of water (about 20 milliliters), infused for 2.5 minutes the first time, then 30 seconds afterwards. Try 1 gram of leaves for 2/3 ounce of water (about 20 milliliters), infused for 2 minute the first time, then 30 seconds afterwards. If you do not have a thermometer, the recommended procedure is to heat the water to boiling, then remove from heat. Let it cool for a few minutes, then use it to heat your tea pot and tea cups. Leave the hot water in each vessel for a minute or two. This has the advantage of cooling the water to the appropriate temperature and pre-warming the tea pot and tea cups. I had the opportunity to try O-Cha's Uji Gyokuro Kame-Jiru-Shi. When I opened the bag, I was impressed by the intensely sweet fragrance, almost like fresh grass or a new bale of hay. It took a couple of tries for me to learn how to brew this tea correctly. The first time, either the water was too hot or I allowed it to steep for too long. It came out somewhat bitter. The second time, however, I managed to get it right. The tea was slightly sweet, with a rich, vegetal flavor. But it lacks the depth I expect of a truly fine green tea. What I find disappointing is that the leaves are chopped up and mature, not the hand harvested one-bud-and-two-leaves. For an average Western drinker, a sencha tea will serve up a better cup. It is interesting to read about gyokuro, but in reality, I think we have been priced out of the market. If you are a beginner and haven't got a tea scale or thermometer at home, you will struggle to get it right. This is a tea to avoid for a beginner.